It’s hard to understand when bad things happen, and life slips away. People go through a multitude of emotions from fear, anger onto hopelessness and back to fear. For George Usher, this singer/songwriter waged a war in a special way. Unable to play an instrument due to cancer treatment, George fought his battle by writing twelve insightful pieces. 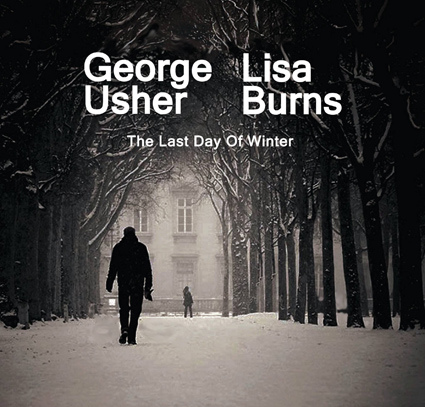 To add flavor to the music, and with the help of Lisa Burns, they worked together assembling an album of hope, The Last Day of Winter. The lyrics in this album are insightful. Their music gives George leverages while giving listeners an avenue of strength. They open with “Wake Me When Tomorrow Comes.” The lyrics are powerful as George and Lisa sing “Tomorrow the World Will Be a Better Place,” “Tomorrow the sky will be so blue,” “Tomorrow the stars will dance and sing.” These words have meaning when going through rough times. Another number “Wasn’t born to Belong,” is a tune dealing with grief as many send messages to themselves. The battle within can be greatest battle. “Maybe I was born with a heart too strong,” or “with a memory to long.” George’s lyrics are honest, real, and come from the soul. Many people might look at this album and see it as dark and depressive. However, this writer feels George Usher and Lisa Burns assembled a message of hope where there is hopelessness. Their message replaces fear for peace. “The Last Day of Winter is beautifully done, lyrics and music together.